This page describes her cult in the Greek colonies of Anatolia, the Black Sea, North Africa and Italy. Her cult was often combined with those of indigenous local godddesses, or such foreign deities were simply renamed "Artemis". 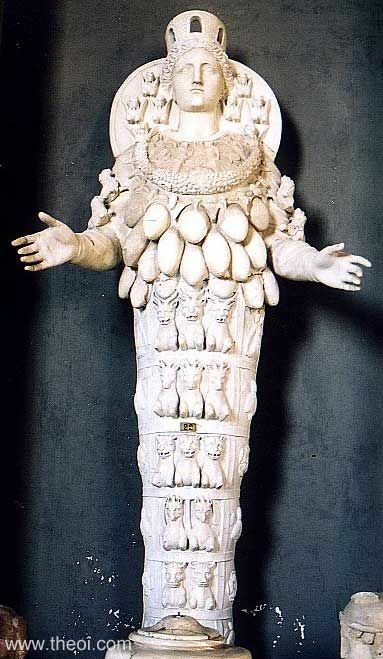 The most significant of these was the Ephesian Artemis--an ancient Anatolian mother-goddess who was depicted with a multitude of egg-shaped breasts. Another was the goddess of the Tauric Chersonese on the Black Sea (now Crimea). The cult of these two foreign "Artemises" spread throughout the Greek world. "The city [of Adrasteia in the Troad] is situated between Priapos and Parion; and it has below it a plain that is named after it, in which there was an oracle of Apollon Aktaios (of the Shore) and Artemis." "Astyra [on the Gulf of Adramyttene in the Troad], a village with a precinct sacred to Artemis Astyrene." "The village Astyra [in the Troad] belongs to Mysia. It was once a small town, where, in a sacred precinct, was the temple of Artemis Astyrene, which was superintended, along with holy rites, by the Antandrians, who were its nearer neighbors." "Khryseis [mythical daughter of a priest of Apollon] was taken from Hypoplakinan Thebes [at the foot of Mt Palkios near Troy] . . . [when she had] gone there to sacrifice to Artemis, as the author of the Kypria states." "But when the maidens (nymphai) encircle thee in the dance [on Delos] . . . or Pitane [in Aiolia or Lakedaimonia?] --for Pitane too is thine . . . the lights of day are lengthened [i.e. in mid-summer]." "One sees traces of a sanctuary of Artemis, surnamed Kordax [at Pisa in Elis] because the followers of Pelops celebrated their victory by the side of this goddess and danced the cordax, a dance peculiar to the dwellers round Mount Sipylos [in Lydia]." "[The historical] Adrastos, a Lydian, helped the Greeks as a private individual, although the Lydian commonwealth held aloof. A likeness of this Adrastos in bronze was dedicated in front of the sanctuary of Artemis Persia (of Persia) [in Lydia] by the Lydians, who wrote an inscription to the effect that Adrastos died fighting for the Greeks against Leonnatos." "Within forty stadia from the city [of Sardeis in Lydia] one comes to [Lake] Gygaia, which is mentioned by the poet, the name of which was later changed to Koloe, where is the temple of Artemis Koloënes, which is characterized by great holiness. They say that at the festivals here the baskets dance, though I do not know why in the world they talk marvels rather than tell the truth." "The first Greeks whom he [Kroisos king of Lydia, C6th B.C.] attacked were the Ephesians. These, besieged by him, dedicated their city to Artemis; they did this by attaching a rope to the city wall from the temple of the goddess, which stood seven stades away from the ancient city which was then besieged." "Thee [Artemis] the Amazones, whose mind is set on war, in Ephesos beside the sea established an image beneath an oak trunk, and Hippo [queen of the Amazones] performed a holy rite for thee, and they themselves, O Oupis Queen, around the image danced a war-dance--first in shields and armour, and again in a circle arraying a spacious choir. And the loud pipes thereto piped shrill accompaniment, that they might foot the dance together--for not yet did they pierce the bones of the fawn [i.e. to create flutes], Athene's handiwork, a bane to the deer. And the echo reached unto Sardis and to the Berekynthian range [in Phrygia]. And they with their feet geat loudly and therewith their quivers rattled. And afterwards around that image was raised a shrine of broad foundations [i.e. of the Ephesian shrine]. That it shall dawn behold nothing more divine, naught richer. Easily would it outdo Pytho [Delphoi]." "As for the temple of Artemis [at Ephesos], its first architect was Khersiphron; and then another man made it larger. But when it was set on fire by a certain Herostratos, the citizens erected another and better one, having collected the ornaments of the women and their own individual belongings, and having sold also the pillars of the former temple. Testimony is borne to these facts by the decrees that were made at that time. Artemidoros says : Timaios of Tauromenion, being ignorant of these decrees and being any way an envious and slanderous fellow (for which reason he was also called Epitimaios), says that they exacted means for the restoration of the temple from the treasures deposited in their care by the Persians; but there were no treasures on deposit in their care at that time, and, even if there had been, they would have been burned along with the temple; and after the fire, when the roof was destroyed, who could have wished to keep deposits of treasure lying in a sacred enclosure that was open to the sky? Now Alexandros [the Great], Artemidoros adds, promised the Ephesians to pay all expenses, both past and future, on condition that he should have the credit therefore on the inscription, but they were unwilling, just as they would have been far more unwilling to acquire glory by sacrilege and a spoliation of the temple. And Artemidoros praises the Ephesian who said to the king that it was inappropriate for a god to dedicate offerings to gods. After the completion of the temple, which, he says, was the work of Kheirokrates . . . the great number of dedications in general were secured by means of the high honor they paid their artists, but the whole of the altar was filled, one might say, with the works of Praxiteles. They showed me also some of the works of Thrason, who made the Hekatesion [i.e. the shrine of Hekate, or Artemis Hekate], the waxen image of Penelope, and the old woman Eurykleia. They had eunuchs as priests, whom they called Megabyzoi. And they were always in quest of persons from other places who were worthy of this preferment, and they held them in great honor. And it was obligatory for maidens to serve as colleagues with them in their priestly office. But though at the present some of their usages are being preserved, yet others are not; but the temple remains a place of refuge, the same as in earlier times, although the limits of the refuge have often been changed; for example, when Alexandros [the Great] extended them for a stadium, and when Mithridates shot an arrow from the corner of the roof and thought it went a little farther than a stadium, and when Antony doubled this distance and included within the refuge a part of the city. But this extension of the refuge proved harmful, and put the city in the power of criminals; and it was therefore nullified by Augustus Caesar." "When the Phokaians were setting sail from their homeland [to colonize Gaul] an oracle was delivered to them, it is said, to use for their voyage a guide received from Artemis Ephesia; accordingly, some of them put in at Ephesos and inquired in what way they might procure form the goddess what had been enjoined upon them. Now the goddess, in a dream, it is said, had stood beside Aristarkha, one of the women held in very high honour, and commanded her to sail away with the Phokaians, taking with her a certain reproduction [of the main statue of Artemis Ephesia] which was among the sacred images; this done and the colony finally settled [Massilia in Gaul], they not only established the temple but also did Aristarkha the exceptional honour of appointing her priestess; further, in the colonial cities [of Massilia] the people everywhere do this goddess honours of the first rank." "The Selinos River . . . that flows in Ephesos past the Artemision [temple of Artemis]." "It [a temple of Apollon in Ionia] was set on fire by Xerxes, as were also the other temples [of Ionia], except that at Ephesos." "After the outlet of the Kaÿster River comes a lake that runs inland from the sea, called Selinousia; and next comes another lake that is confluent with it, both affording great revenues [i.e. through taxes levied upon pilgrims to the shrine of Artemis at Ephesos]. Of these revenues, though sacred, the kings deprived the goddess, but the Romans gave them back; and again the tax-gatherers forcibly converted the tolls to their own use; but when Artemidoros was sent on an embassy, as he says, he got the lakes back for the goddess . . . and in return for this the city erected in the temple a golden image of him." "All cities worship Artemis Ephesia (of Ephesos), and individuals hold her in honor above all the gods. The reason, in my view, is the renown of the Amazones, who traditionally dedicated the image, also the extreme antiquity of this sanctuary. Three other points as well have contributed to her renown, the size of the temple, surpassing all buildings among men, the eminence of the city of the Ephesians and the renown of the goddess who dwells there." "In Olympia there is a woollen curtain, adorned with Assyrian weaving and Phoenician purple . . . This curtain is not drawn upwards to the roof as is that in the temple of Artemis at Ephesos, but it is let down to the ground by cords." "Another figure of Eris (Strife) is in the sanctuary of Artemis Ephesia (of Ephesos); Kalliphon of Samos included it in his picture of the battle at the ships of the Greeks." "The Ephesians set up in the sanctuary of Artemis not only a statue of Lysandros himself but also statues of Eteonikos, Pharax and other Spartans quite unknown to the Greek world generally." "The cult of Artemis Ephesia (of Ephesos) is far more ancient still than their coming [the settlement of Ionians in Ephesos]. Pindaros, however, it seems to me, did not learn everything about the goddess, for he says that this sanctuary was founded by the Amazones during their campaign against Athens and Theseus. It is a fact that the women from the Thermodon, as they knew the sanctuary from of old, sacrificed to the Ephesian goddess both on this occasion and when they had fled from Herakles; some of them earlier still, when they had fled from Dionysos, having come to the sanctuary as suppliants. However, it was not by the Amazones that the sanctuary was founded, but by Koresos, an aboriginal, and Ephesos, who is thought to have been a son of the river Kaystros, and from Ephesos the city received its name." "It is the custom for these [the priests of Artemis Hymnia in Arkadia] to live their whole lives in purity, not only sexual but in all respects, and they neither wash nor spend their lives as do ordinary people, nor do they enter the home of a private man. I know that the ‘entertainers’ of Artemis Ephesia (of Ephesos) live in a similar fashion, but for a year only, the Ephesians calling them Essenes." "In the temple of Artemis Ephesia Kalliphon of Samos has painted women fitting on the gyala of the corselet of Patroklos." "Autokrates in his Tympanistai : ‘As sweet maidens, daughters of Lydia, sport and lightly leap and clap their hands in the temple of Artemis the Fair at Ephesos, now sinking down upon their haunches and again springing up, like the hopping wagtail.’"
"Pindaros, son of Melas . . . became tyrant of Ephesos by succession . . . When his maternal uncle Kroisos was conquering Ionia and had sent envoys to Pindaros to demand that Ephesos submit to him, the request was refused and Kroisos began a siege of the city. When one of the fortification towers was destroyed . . . he could see disaster looming. Pindaros advised the Ephesians to attach cords from the city gates and towers to the columns of the temple of Artemis as if they were consecrating the city to Artemis. He hoped by this means to ensure that Ephesos would not be captured. He advised them to go plead with the Lydian. When the Ephesians displayed their credentials as suppliants, Kroisos is said to have laughed and accepted the stratagem in good part, allowing the Ephesians unmolested freedom." "Seven Wonders of the World. The temple of Diana [Artemis] at Ephesus which the [mythical] Amazon Otrera, wife of Mars [Ares], made." "Those who first built temples to the gods ... Otrera, an Amazon, wife of Mars [Ares], first founded the temple of Diana [Artemis] at Ephesus, which later by King ((lacuna)) . . restored." "In the city of Ephesus is the spring called Callippia, and a temple of Diana [Artemis] surrounded by two streams, both called Selinus, coming from different directions." "Then [near Ephesos] comes Pygela, a small town, with a temple of Artemis Mounykhia, founded by Agamemnon and inhabited by a part of his troops . . . Then comes the harbor called Panormos, with a temple of Artemis Ephesia; and then the city Ephesos. On the same coast, slightly above the sea, is also Ortygia, which is a magnificent grove of all kinds of trees, of the cypress most of all. It is traversed by the Kenkhrios River, where Leto is said to have bathed herself after her travail [i.e. after giving birth to Artemis and Apollon] . . . There are several temples in the place, some ancient and others built in later times; and in the ancient temples are many ancient wooden images, but in those of later times there are works of Skopas; for example, Leto holding a sceptre and Ortygia standing beside her with a child in each arm. A general festival is held there annually." "After Kolophon one comes to the mountain Korakios and to an isle sacred to Artemis, whither deer, it has been believed, swim across and give birth to their young." "The first city one comes to after Ephesos is Magnesia, which is an Aiolian city . . . In the present city is the temple of Artemis Leukophryene, which in the size of its shrine and in the number of its votive offerings is inferior to the temple at Ephesos, but in the harmony and skill shown in the structure of the sacred enclosure is far superior to it. And in size it surpasses all the sacred enclosures in Asia except two, that [of Artemis] at Ephesos and that [of Apollon] at Didymoi." "Near the statue of Olympiodoros [in Athens] stands a bronze image of Artemis surnamed Leukophryne, dedicated by the sons of Themistocles; for the Magnesians, whose city the King had given him to rule, hold Artemis Leukophryne in honor." "Bathykles of Magnesia, who made the throne of the Amyklaian [Apollon at Amyklai, Lakedaimonia], dedicated, on the completion of the throne . . . an image of Artemis Leukophryne." "Lady of many shrines, of many cities, hail! Khitone (Goddess of the hunting Tunic) [Artemis], sojourner in Miletos; for thee did Neleus [son of Kodros, founder of Miletos] make his Guide, when he put off with his ships from the land of Kekrops [Attika]." "The men of Miletus made an expedition against the Naxians [historical] . . . [during the time of the campaign] came the Milesians' celebration of the Thargelia [i.e. an Ionian festival of Apollon and Artemis held in early summer]--a time when they indulge in a deal of strong wine and make merry with very little regard to the cost." "[In Karia] one comes to a gulf called Glaukos, which has good harbors; then to the Artemision, a promontory and temple; then to the sacred precinct of Leto, above which, and above the sea, at a distance of sixty stadia, lies Kalynda, a city." "Near Bargylia [in Karia opposite the island of Kos] is the temple of Artemis Kindyas, round which the rain is believed to fall without striking it. And there was once a place called Kindye." "Which now of islands . . . finds most favour with thee [Artemis]? . . . What city? . . . of cities Perge [in Pamphylia]." "The Kestros River [in Pamphylia]; and, sailing sixty stadia up this river, one comes to Perge, a city; and near Perge, on a lofty site, to the temple of Artemis Pergaia, where a general festival is celebrated every year." "[The female poet Damophyle] composed the hymns which they sing in honour of Artemis Pergaia (of Perga), in the Aiolian and Pamphylian modes." "Darius [Persian king, C6th B.C., built a bridge across the Bosporos] and when he had viewed the Bosporos also, he set up two pillars of white marble by it, engraving on the one in Assyrian and on the other in Greek characters the names of all the nations that were in his army: all the nations subject to him . . . These pillars were afterward carried by the Byzantines into their city and there used to build the altar of Artemis Orthosia, except for one column covered with Assyrian writing that was left beside the temple of Dionysos at Byzantion." "Halia, the daughter of Sybaris, was entering a grove of Artemis (the grove was in Phrygia [or Mysia]) when a divine Drakon appeared to her--it was of immense size--and lay with her. And from this union sprang the Ophiogeneis (Snake-born) of the first generation." "Pylai (the Gates), as it is called, which is the boundary between the Kilikoi (Cilicians) and the Syrians. In Kilikia is also the temple and oracle of Artemis Sarpedonia; and the oracles are delivered by persons who are divinely inspired." Aeschylus' lost drama The Priestesses was the thrid of a trilogy of plays describing the story of Iphigeneia. The Taurian priestesses of the goddess Artemis formed the chorus. "[From the story of Iphigeneia :] The bee-keepers (melissonomoi) are at hand to open the house of Artemis." "In this cape [of the Tauric Khersonesos] is situated a city of the Herakleotai, a colony of the Herakleotai who live on the Pontos, and this place itself is called Khersonesos ... In this city is the temple of the Parthenos (the Maiden) [Tauric Artemis], a certain deity; and the cape which is in front of the city, at a distance of one hundred stadia, is also named after this deity, for it is called the Parthenion, and it has a shrine and xoanon of her." "It is thought that Orestes, with his sister Iphigeneia, brought these sacred rites here [to Komana in Kappadokia, Asia Minor] from the Tauric Skythia, the rites in honor of Artemis Tauropolos [here identified with a Kappadokian goddess]." "There is also a sanctuary [at Athens] of Artemis Brauronia (of Brauron); the image is the work of Praxiteles, but the goddess derives her name from the parish of Brauron. The old wooden image is in Brauron, Artemis Tauria (of Tauros) as she is called." "At some distance from Marathon is Brauron, where, according to the legend, Iphigeneia, the daughter of Agamemnon, landed with the image of Artemis when she fled from the Tauroi; leaving the image there she came to Athens also and afterwards to Argos. There is indeed an old wooden image of Artemis here, but who in my opinion have the one taken from the foreigners I will set forth in another place." "The place named Limnaion (Marshy ) [in Lakedaimonia] is sacred to Artemis Orthia (Upright ). The wooden image there they say is that which once Orestes and Iphigeneia stole out of the Tauric land, and the Lakedaemonians say that it was brought to their land because there also Orestes was king. I think their story more probable than that of the Athenians. For what could have induced Iphigeneia to leave the image behind at Brauron? Or why did the Athenians, when they were preparing to abandon their land, fail to include this image in what they put on board their ships? And yet, right down to the present day, the fame of the Tauric goddess has remained so high that the Kappadokians dwelling on the Euxinos [Black Sea] claim that the image is among them, a like claim being made by those Lydians also who have a sanctuary of Artemis Anaeitis. But the Athenians, we are asked to believe, made light of it becoming booty of the Persians. For the image at Brauron was brought to Susa, and afterwards Seleukos gave it to the Syrians of Laodicka, who still possess it. I will give other evidence that the Orthia in Lakedaimon is the wooden image from the foreigners. Firstly, Astrabakos and Alopekos, sons of Irbos, son of Amphisthenes, son of Amphikles, son of Agis, when they found the image straightway became insane. Secondly, the Spartan Limnatians, the Kynosourians, and the people of Mesoa and Pitane, while sacrificing to Artemis, fell to quarreling, which led also to bloodshed; many were killed at the altar and the rest died of disease. Whereat an oracle was delivered to them, that they should stain the altar with human blood. He used to be sacrificed upon whomsoever the lot fell, but Lykourgos changed the custom to a scourging of the lads, and so in this way the altar is stained with human blood. By them stands the priestess, holding the wooden image. Now it is small and light, but if ever the scourgers spare the lash because of a lad's beauty or high rank, then at once the priestess finds the image grow so heavy that she can hardly carry it. She lays the blame on the scourgers, and says that it is their fault that she is being weighed down. So the image ever since the sacrifices in the Tauric land keeps its fondness for human blood." "It is the sprinkling of the altar [of Artemis at Sparta] with human blood that is important, for the Skythoi too held the altar to be worthy thereof; but the Lakedaimonians modified the ceremony of [human] sacrifice because of its implacable cruelty, and turned it into a contest of endurance." "And both Athene and Artemis, the myth goes on to say, who had made the same choice of maidenhood as had Kore [Persephone] and were reared together with her [on the island of Sicily], joined with her in gathering the flowers, and all of them together wove the robe [of spring] for their father Zeus. And because of the time they had spent together and their intimacy they all loved this island above any other, and each one of them received for her portion a territory, Athene receiving hers in the region of Himera . . . Artemis received from the gods the island of Syrakouse which was named after her, by both the oracles and men Ortygia. On this island likewise these Nymphai [the Naiades of the region], to please Artemis, caused a great fountain to gush forth to which was given the name Arethousa. And not only in ancient times did this fountain contain large fish in great numbers, but also in our own day we find these fish still there, considered to be sacred [to Artemis] and not to be touched by men." "I once saw an elephant's skull in the sanctuary of Artemis in Kampania [in Italia]. The sanctuary is about thirty stades from Kapua, which is the capital of Kampania." The Roman Goddess Diana was identified with Artemis. Her major shrine at Arikia was believed to be of Greek or Skythian origin. "The xoanon of that Artemis [Diana] which is on the Aventine Hill [in Rome] was constructed by the Romans on the same artistic design as the xoanon which the Masiliotes [Greek colony in Gaul] have." "After Mount Albinos comes Arikia, a city on the Appian Way [near Rome] . . . to the left of the Way as you go up from Arikia, is the Artemision (Temple of Artemis [Diana]), which they call Nemos [Nemus Dianae]. The temple of the Arikian, they say, is a copy of that of the Tauropolos [in Skythia]. And in fact a barbaric, and Skythian, element predominates in the sacred usages, for the people set up as priest merely a run-away slave who has slain with his own hand the man previously consecrated to that office; accordingly the priest is always armed with a sword, looking around for the attacks, and ready to defend himself. The temple is in a sacred grove, and in front of it is a lake which resembles an open sea, and round about it in a circle lies an unbroken and very high mountain-brow, which encloses both the temple and the water in a place that is hollow and deep. You can see the springs, it is true, from which the lake is fed (one of them is Egeria, as it is called after a certain deity), but the outflows at the lake itself are not apparent, though they are pointed out to you at a distance outside the hollow, where they rise to the surface. Near these places is also Mount Albanos, which rises considerably above the Artemision and the mountain-brows around it, though they too are high and rather steep." "When Hippolytos was killed, owing to the curses of Theseus, Asklepios raised him from the dead. On coming to life again he refused to forgive his father rejecting his prayers, he went to the Arikians in Italia. There he became king and devoted a precinct to Artemis [Diana], where down to my time the prize for the victor in single combat was the priesthood of the goddess. The contest was open to no freeman, but only to slaves who had run away from their masters." "Among the Henetoi [of northern Italy] certain honours have been decreed to [the mythic hero] Diomedes . . . and two precincts are still to be seen--one of them sacred to Hera Argeia (of Argos) and the other to Artemis Aitolis (of Aitolia). But some mythical elements, of course, have been added: namely, that in these sacred precincts the wild animals become tame, and deer herd with wolves, and they allow the people to approach and caress them, and any that are pursued by dogs are no longer pursued when they have taken refuge here." "Massilia [in Gaul] was founded by the [Greek] Phokaians, and it is situated on a rocky place. Its harbour lies at the foot of a theatre-like rock which faces south . . . It is on the headland that the Ephesion [temple of Artemis Ephesia] and also a temple of Apollon Delphinios (of the Dolphins) are situated. The latter is shared in common by all Ionians, whereas the Ephesion is a temple dedicated solely to Artemis Ephesia (of Ephesos): for when the Phokaians were setting sail from their homeland an oracle was delivered to them, it is said, to use for their voyage a guide received from Artemis Ephesia; accordingly, some of them put in at Ephesos and inquired in what way they might procure from the goddess what had been enjoined upon them. 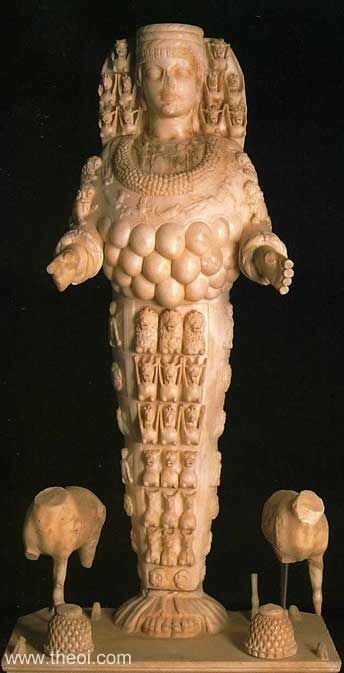 Now the goddess, in a dream, it is said, had stood beside Aristarkha, one of the women held in very high honour, and commanded her to sail away with the Phokaians, taking with her a certain reproduction [of the main statue of Artemis Ephesia] which was among the sacred images; this done and the colony finally settled, they not only established the temple but also did Aristarkha the exceptional honour of appointing her priestess; further, in the colonial cities [of Massilia] the people everywhere do this goddess honours of the first rank, and they preserve the artistic design of the ‘xoanon’ [primitive wooden images which were supposed to have originally fallen from heaven] the same, and all the other usages precisely the same as is customary in the mother-city." "They [the people of Massilia] founded in Iberia [towns] as strongholds against he Iberians, and thy also taught the Iberians the sacred rites of Artemis Ephesia, as practiced in the fatherland, so that they sacrifice by the Greek ritual." "They [the Massiliotes] also established a temple of Artemis Ephesia there [i.e. at the mouth of the Rhodanos in southern Gaul], after first enclosing a piece of land which is made an island by the mouths of the river." "They [the people of the Greek colony of Massilia in Gaul] founded in Iberia [towns] as strongholds against he Iberians, and thy also taught the Iberians the sacred rites of Artemis Ephesia, as practiced in the fatherland, so that they sacrifice by the Greek ritual."